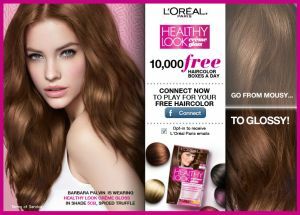 Get a free Box of L’Oreal Healthy Look Hair Color. 10,000 people to enter the Instant win game and you will get a FREE Box of L’Oreal Healthy Look Hair Color. Click the link below to go to heir Facebook page. Get a free L’Oreal Hair Color.